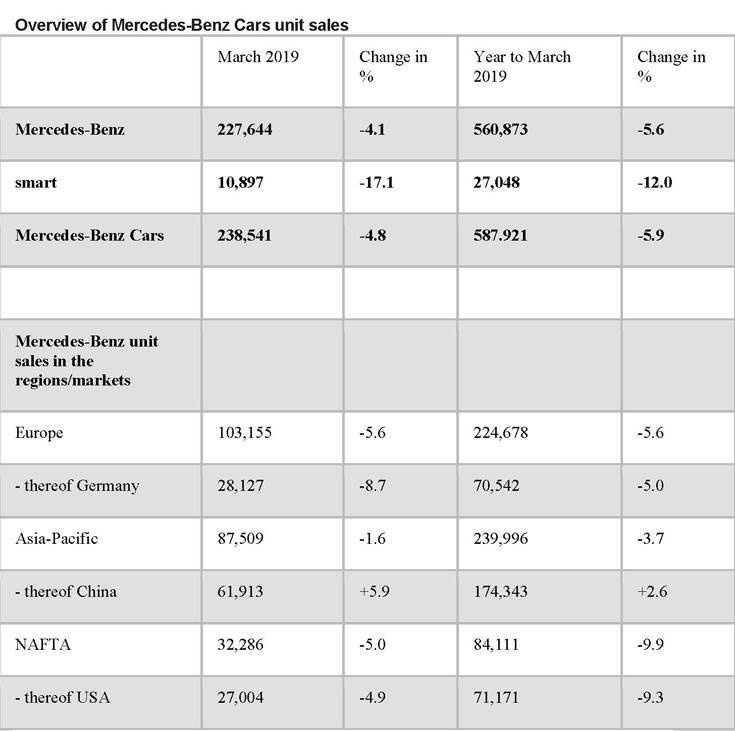 Mercedes-Benz has closed the first quarter of 2019 with 560,873 passenger cars sold worldwide (-5.6%). For the third year in a row, sales in the first quarter were well over 550,000 units. In March, 227,644 vehicles with the three-pointed star were delivered (-4.1%). The first three months of the year featured important model changes in the highest-volume SUV and compact-car segments. The company expects an increasing vehicle availability in the next months and therefore global sales to increase slightly overall in 2019. Since the beginning of the year, Mercedes-Benz has maintained its market leadership in the premium segment in Germany, UK, France, Italy, Switzerland, Sweden, Portugal, Poland, Denmark, South Korea, Australia, Canada, Brazil and other markets. In Europe, Mercedes-Benz sold 103,155 vehicles in March (-5.6%) and in March sales amounted to 224,678 (-5.6%). The discontinuation of the CLA and the GLE due to the model change had an impact on unit sales in many European markets. In Germany, the region’s core market, sales of 70.542 units were achieved in the first quarter (-5.0%). In the United Kingdom, first quarter sales increased by 1.1%, while the best-ever first-quarter unit sales were achieved in France, Poland and in Denmark. In the Asia-Pacific region, Mercedes-Benz delivered 87,509 cars last month (-1.6%). Unit sales reached a new record in China, the region’s core market: 61,913 customers (+5.9%). Mercedes-Benz concluded the first three months of the year, as the best quarter ever in China (+2.6%) with sales of 174,343 units. The long-wheelbase versions of the C-Class and E-Class Saloon, which are popular in the Chinese market, set new records in both March and the first quarter. Unit sales in Malaysia increased to a new all-time high for the month of March (+40.3%). Mercedes-Benz sold in total 32,286 vehicles in the NAFTA region in March (-5.0%). In the core market, the United States, a total of 27,004 customers received their new model with the three-pointed star last month (-4.9%). At the end of the first quarter, deliveries in the USA amounted to 71,171 units (-9.3%). In Mexico sales increased by 1.1% in March. In the first quarter of 2019, more than 67,077 compact cars were handed over to customers – a new best value in March (+2.3%). Worldwide unit sales of the A-Class increased by 25.6% during the last three months – never before so many A-Classes have been sold worldwide in the first three months of a year, as in 2019. One month after the market launch in Europe, unit sales of the new B-Class increased in Germany, UK, France, and Spain. Due to the successful market launch of the B-Class, more compact cars were sold in Europe than ever before in the first three months of a year (+5.3%). More than 20,000 'dream cars' (coupés, cabriolets and roadsters) from Mercedes-Benz were delivered in March to customers worldwide (+1.9%). Sales of the CLS Coupé continued to grow, with strong increases in March and the first quarter.